Front Row & Co.’s 2018 collection is full of relaxed and fun leisurewear styles, made from carefully chosen fabrics and clever detailing. Look out for lots of new styles, and new colours added to some of your favourites. The range is designed blank, ready to display your brand, image or logo. Travelling to and from matches warrants the need for a practical team bag or holdall; the FR960 Canvas Holdall is perfect for fitting in whole team kits with its impressive 35 litre capacity while also ensuring your team stays stylish when they are on the move. 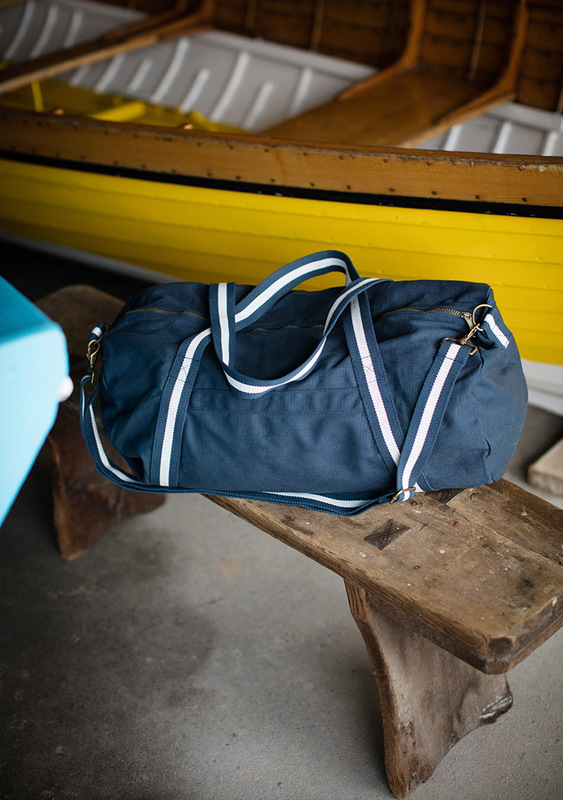 This robust holdall features Blue and White striped webbing side straps with a detachable shoulder strap and handy carry straps on one side. Carrying a large amount of kit is easy with the reinforced base panel ensuring that your team has a much needed well-structured holdall. The antique coloured trims set this cool bag up for many a compliment while the internal zip pocket detail is ideal for smaller belongings (100% Cotton, 410gsm Heavy Canvas, Size: Length – 60cm x Width 29cm x Height 28cm). Pair the FR960 Holdall with one of the new Front Row Polo casual tops such as the FR130 Washed Long Sleeved Henley T-Shirt with its ‘grandad collar’ and 3-button-placket or the FR134 Long Sleeved Breton Striped T-Shirt, available in Navy/White or White/Navy for the ultimate casual, laidback style.